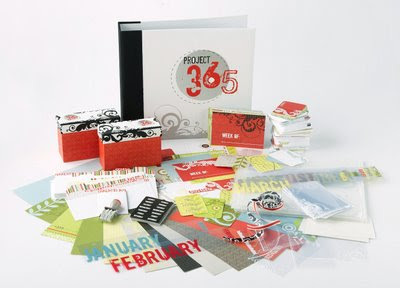 SUSIE Q-TIP: Have you heard of Project 365? It's a cool and VERY simple scrapbooking idea from Becky Higgins (there's LOTS of info on her blog, especially from December '08). I haven't gotten to order my kit yet, as they are out right now (but working on getting more), but my pictures so far are sure interesting! Take a look and let me know if you plan to join me, and I'll make a new blog listing on my sidebar! It's not too late! HERE'S a PDF with the TOP 10 reasons to do Project 365. HERE'S a PDF with 365 ideas for the project. I LOVE it! Well, it seems as though there were a few issues surrounding the number of kits they made and it looks sort of "iffey" that they will be able to make more for those of us who missed out on ordering them the first time. So why am I moping about all this? Because I REALLY want to do this project and I've already started taking my pictures for it even. If there is anyone out there who has ordered the kit, but has now decided against doing Project 365 for whatever reason, will you PLEASE email me. I would love to BUY it from you for what you paid for it plus shipping. If it is impossible for me to obtain the kit, does anyone else have any bright ideas as to how they are accomplishing it so easily without it? I'm losing sleep over it!!! I don't know if you're into digital at all but at Designers Digitals you can get some layered templates for the 365 Days Project (look for Katie Pertiet). Otherwise...hmm...I'm thinking of just doing a normal 2 spread layout per week. Since I'm from europe I didn't even try to get the kit (although I love it) because of the shipping costs. Good luck for your search though. I'm still doing it. My plan was to do it without the kit to begin with anyways. The pictures are 2 rows of 4 on a 2 page layout with journal boxes at the bottom. There's soo many ways you can do it, that I can't wait to get started. My stash is certainly big enough and I have a Cricut at home that I can use to make my diecuts, so i'm not worried about it. It's just going to take a little more time is all.. Good luck in your search though! I thought about ordering this a while back, but figured I could do the same thing on my own very easily and do it in my own style. Basically take a pic every day and journal about it - no need to spend the cash on a kit - LOL - but that's just me. Thanks for sharing..I might have to incorporation something similar and give it a shot anyway. I am a long time lurker -- and I just love coming to your blog to see what is new and gorgeous~ your work inspires me :). I do not have the project 365 you would like to purchase (sorry) but wanted to make sure that you had seen the latest post on Becky Higgin's blog--she has asked folks to post in her comment area what *they* are doing *in the place of*. Here's the link: http://www.beckyhiggins.com/blog/ You probably already have posted on it, there are so many comments I have not read them all, but as I said, I just wanted to make sure you had seen it. I hope someone has a good idea that you can use since you have shared so many of your very own good ideas with us!